A transformer is an electrical or electronic device which changes voltage; in garden lighting this is usually from mains voltage (240 volt s a.c. - alternating current) to low voltage (12 volts a.c). From the transformer to the garden lights low voltage cables typically run under mulch, gravel, paving, decking or over structures. To minimise cable voltage drop to the garden lights, identify groups of garden lights which can be supplied from one central transformer. Check that the transformer location is within the length of the low voltage cable permitted (see Low voltage cabling layout.) In many small rear gardens, a typical garden lighting configuration may require one transformer on each side of the garden and perhaps one transformer to cover features at the far end of the garden. Garden lighting transformers should all be weatherproof to IP55 or higher for surface mounting or IP68 for ground burial usage. Many cheap garden lighting kits are supplied with an interior transformer, which must be mounted in an outbuilding or housed in a weatherproof outer box - you are better off with proper professional transformers than trying to "make do" with an unsuitable transformer. Professional garden lighting transformers all include a thermal cut-off to protect the transformer against short circuits, though all circuits supplying transformers must be protected by a fuse or circuit breaker as well as an RCD. 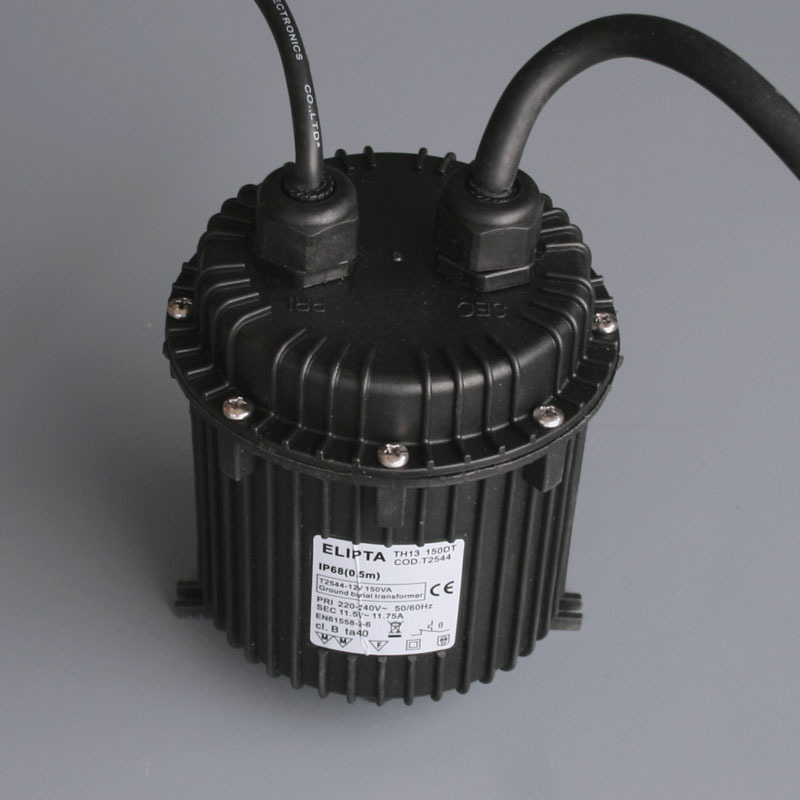 Most ordinary electronic transformers are not sealed against moisture of any kind and the printed circuit board can be vulnerable to condensation in a weatherproof junction box, so if you are using electronic transformers in an exterior lighting installation then use potted electronic transformers resin sealed to IP67 and resistant to condensation. They are usually dimmable , which is especially useful where the load may be varied, by adding a light or changing the lamp wattages, and a constant voltage is still needed to avoid over-voltage and prolong lamp life. 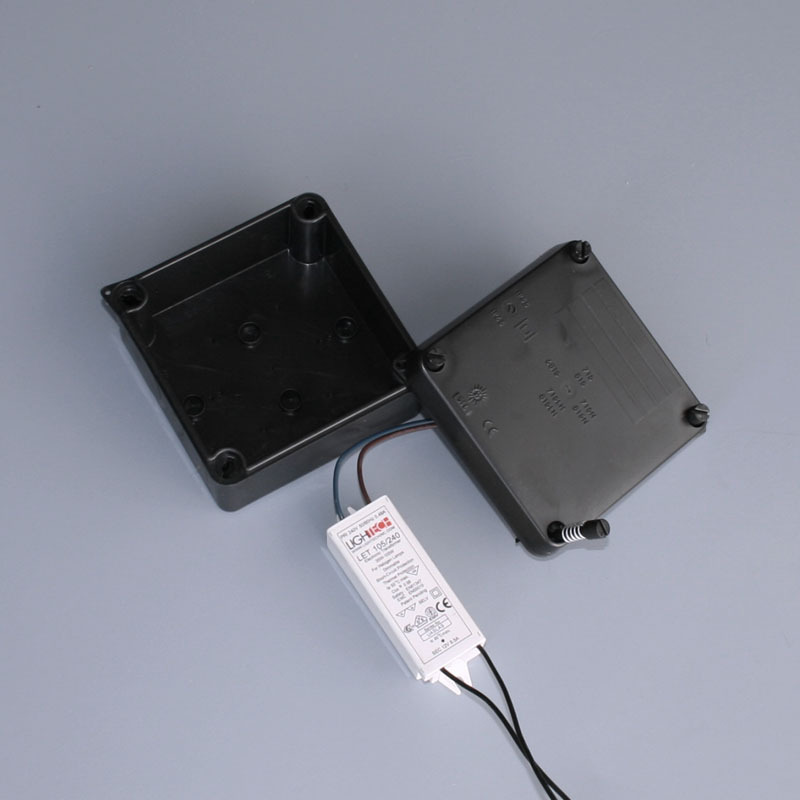 They are available as potted transformers for contractors to fit in their own enclosures (for example, to make up twin transformers in one enclosure), mounted in IP65 black enclosures, or with a resin sealant in a ground burial electronic transformer kit where surface mounting is not possible. Even though many led products are now designed for ac supply rather than dc as they used to be, it is advisable to run them from a magnetic (wire wound or toroidal) transformer, not an electronic type as the circuitry in the led units and electronic transformer can interact to cause flickering, especially on longer cable runs. Magnetic transformers for garden lighting come in 2 forms - wire wound types around an "E core" producing a cube-shaped transformer, and a toroidal type which is donut shaped. 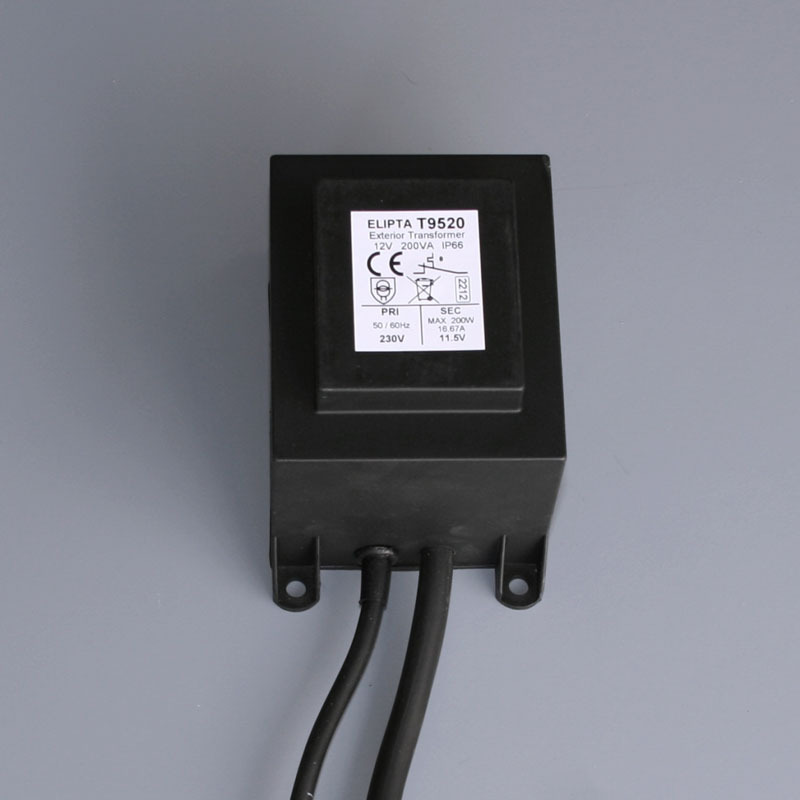 Elipta's standard surface mount garden lighting transformers are magnetic (wire wound) types housed in black weatherproof IP66 boxes to be mounted on a wall or post, in manholes, outbuildings or under decking. Where a wall or fence post isn't available for mounting, use a mounting spike or post to locate the transformer behind planting or a landscape feature. Only an IP68 transformer can be left lying on the ground where water may pool after heavy rain, and it is in any case essential that 240 volt junction boxes used for connecting transformers to an armoured cable are clear of possible water ingress. For safety 12 volt and 240 volt cables must be segregated, which often means a "3 box" installation - a 240 volt IP rated enclosure (jargon for weatherproof junction box) to connect to the armoured supply cable, the sealed transformer and another IP rated enclosure for the connections to the 12 volt cables running out to the lights. Ground burial 12 volt transformers are used where standard surface-mount transformers can't be hidden above ground, such as in lawns or gravel areas, and it is not possible to use a 240 volt light instead. Elipta's Ground burial transformers feature a polycarbonate enclosure into which the magnetic (wire wound) toroidal transformer is resin sealed. The transformer incorporates a thermal overload cutoff and is connected via the 1.5m rubber cables fitted. To avoid "wicking" of moisture into the transformer, connection to mains supply cables and multiple lighting cables must be via resin sealed underground joints; connection to a single 12 volt light may be by means of a heat shrink cable joint kit of a type where a melting adhesive provides a waterproof seal around the joint. Burying transformers is not as satisfactory as surface mounting them from the point of view of future additions or trouble shooting in the event of a fault; it is a good idea to provide wiring access points, where cables to different buried transformers can be accessed for testing, or to use multi-core cables with transformers connected to different wire pairs which can be traced in the event of a fault.